The D branch's setup is very similar to that of the Mattapan Line, albeit slightly less scenic. The Mattapan Line runs along a former right-of-way of the Boston and New Haven Railroad, and likewise the D branch runs along a former right-of-way of the Boston and Albany Railroad. The D branch, like the Mattapan Line, runs completely separate from cars, allowing for speedy and direct service from Newton and Brookline to downtown Boston. When the Boston and Albany Railroad abandoned the Highland Branch, the right-of-way the D branch uses today, in 1958, the MTA acquired the right-of-way and converted it to run streetcars as opposed to the heavy-rail commuter trains that once ran along the route. New tracks were installed, and overhead wires were constructed above them. Initially, it was also thought to construct a subbranch of the D branch that would operate to Needham Junction in addition to Riverside Station, where the branch terminates today. 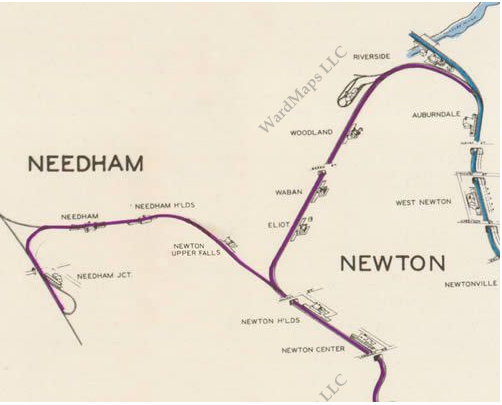 The Boston and Albany Railroad also ran service to Needham Junction, right in Needham Center, and extending light rail service to Needham would have provided a convenient commuter line in addition to the Commuter Rail line and 59 bus that still operate today. However, the MTA did not construct the extension, and the old right-of-way to Needham sits abandoned and overgrown to this day. Last I heard, they were considering converting the Needham right-of-way into a rail trail for bikers and walkers to enjoy. 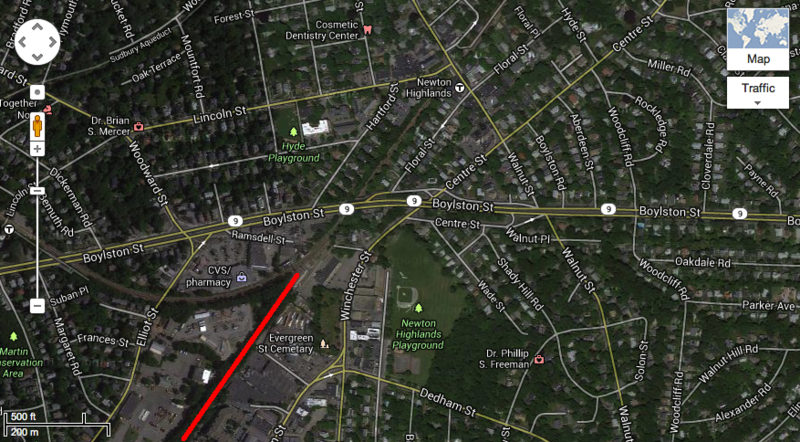 Annotated Google Map showing where the Needham extension would have diverged from the D branch. After the D branch's Newton Highlands station, there would have been a switch allowing trains to continue either to Riverside or to Needham. MTA 1945 "Proposed Extensions" map showing the Riverside and Needham extensions, which at the time were both proposals. Today, the D branch runs from Riverside Station in Newton through Newton and Brookline to the subway and downtown Boston. Speaking from personal experience, the D branch is generally the quickest way of getting downtown from the suburbs; the exclusive right-of-way makes all the difference. Because of its' separation from traffic, the D branch is able to run at excessive speeds, up to 50 MPH, which speeds up D branch service significantly! While riding the branch, note the station buildings at Newton Highlands and Newton Centre Stations. These are the only two original Boston and Albany Railroad stations along the Highland Branch left standing! While they now house shops, one can still tell that these buildings were once train stations. View of the old Boston and Albany Railroad station that still stands at the Newton Centre D branch stop. Aerial view of Fenway Station. The blue arrow shows the path of the D Branch right-of-way; the Green Line Type 7 streetcar stopped up ahead is stopped at the Fenway Station platform. 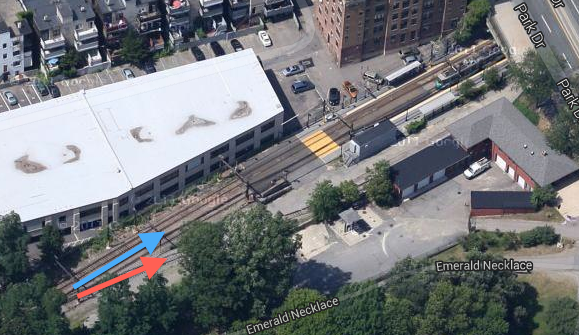 The red arrow shows the path of the Red Sox game storage spur off of the main tracks. Rather, the train continued straight over the present-day subway portal and through the large parking lot often used for Red Sox games today lot to connect with the tracks that have since been reconfigured and extended along the later Mass Pike. The trains would continue along the present-day Pike route into Boston, which was the path of a former railroad right-of-way (see "Copley Square" for more information). 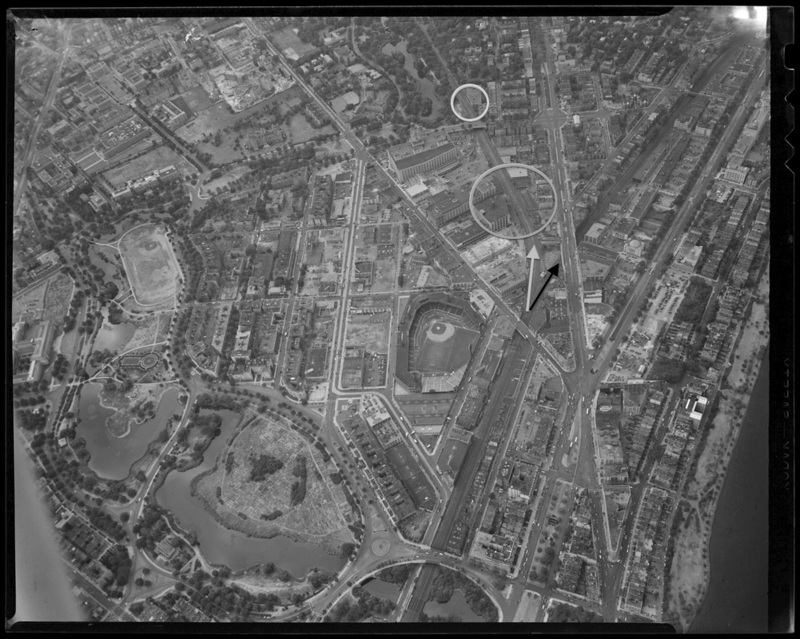 1950s view of the Fenway-Kenmore area showing the old split of the B & A RR to either the New York Central Division, shown with a black arrow, or the Highland Branch (present-day D Line), shown with a gray arrow. Most of the buildings in the big gray circle have since been demolished to make way for the Red Sox parking lot; the small gray circle shows the present-day location of Fenway Station. Follow the black arrow over Beacon Street, and note the apartment buildings on the left side of the right-of-way, along Mountfort Street, that have since been cleared to make way for the Pike. Image courtesy Boston Public Library. Present-day configuration of the D Branch subway. 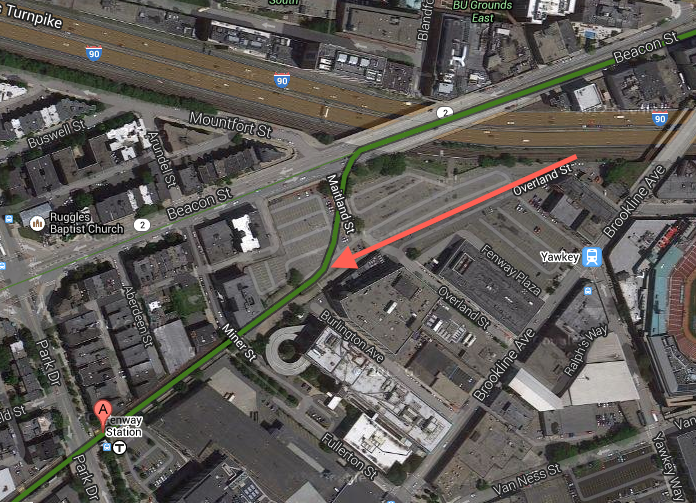 The subway, shown by Google in green, continues under the parking lot to meet the C and D branches at Kenmore. The red arrow shows the former path of the B & A RR right-of-way through what is now the parking lot; look at the larger circle in the last photograph and note that a few buildings were demolished to make way for the parking lot. Image copyright Google Maps. The B & A RR's path is indicated by track notations; ignore the red lines, which show streetcar trackage on this 1940s map. From the west, the B & A trains from the Highland Branch and New York Central Division would continue along the right-of-way the Mass Pike now follows to connect in the vicinity of Back Bay Station (though not at the station, rather at the B & A RR's own stations; see "Copley Square" for more details) with the old New York, New Haven and Hartford Railroad embankment through Roxbury and Jamaica Plain! If you have read the "Boston's Cancelled Highways" article on this website, you will know that the old embankment later made way for the Southwest Corridor, which was to house I-95's proposed extension through Boston! 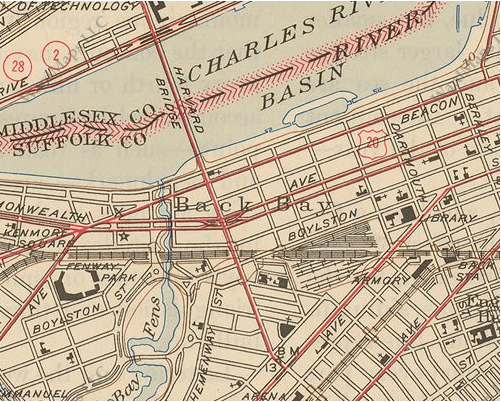 Note: The Roxbury and Jamaica Plain embankment was once used by the Boston and Providence Division of the New York, New Haven and Hartford Railroad. Both NY NH & H RR and B & A RR trains would then continue along a shared right-of-way to South Station, Boston's union train station since the turn of the century. Today, MBTA Commuter Rail trains, as well as the new Orange Line, operate along the former NY NH & H RR embankment's right-of-way through the new Southwest Corridor.